The 1971 Mustang brought a major change in styling, weight and performance. Many Ford Mustang buyers preferred the earlier first generation size and styling, but sales remained strong at a total production of 149,678 cars. Choices remained abundant for Ford Mustang buyers, from standard inline six cylinder coupes to the very impressive Boss 351 and Mach 1. The new design Mustang had gained weight, tipping the scales at over 3,500 lbs for the 351 Cobra Jet, compared to just over 3,200 lbs for the heaviest of the previous year 1970 Mustangs. Although much of the weight increase was due to tightening safety regulations, Ford's marketing efforts concentrated on new styling and features such as hidden windshield wipers, color keyed racing mirrors and strategically placed appliques designed to accent the new design. 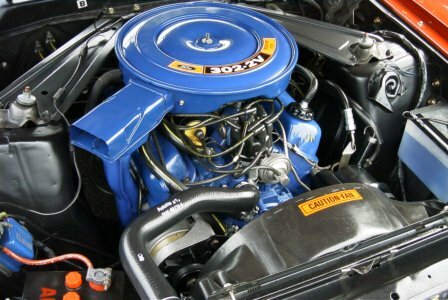 Engine choices for the 1971 model year included the anemic 250 cubic inch I6 with 145 horsepower,a 302 cubic inch 2 barrel V8 with 210 horsepower,a 351 cubic inch 2 barrel 240 hp motor and two 351 cubic inch Cobra Jet motors weighing in at 285 and 330 horsepower respectively. The remaining 2 engine choices were the high compression 429 cubic inch Cobra Jet-R with 370 horsepower and the 429 Super Cobra Jet-R sporting a very strong (and probably very conservatively rated) 375 horsepower. Although these numbers were certainly respectable, the 1971 Mustang really never took off. Here's a 1971 Mustang VIN Decoder to see exactly what how your Mustang specs out. 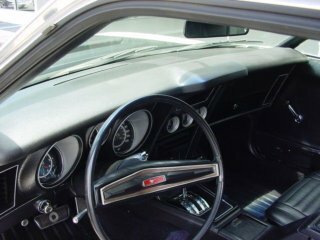 Below are the engine choices available on the 1971 Ford Mustangs. 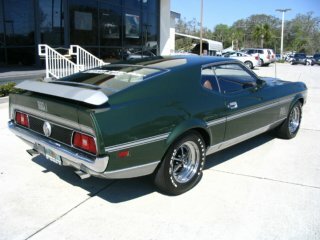 Styling is a matter of preference, and some enthusiasts feel that the 1971 Ford Mustang, particularly the sports roof models, more commonly known as a fastback, like the muscular looking Mach 1, is one of the nicest looking cars ever produced by Ford. Insurance companies, however had a different take. Racy styling, big tires and displacements over 400 cubic inches meant two things. Accidents and speeding. Premiums, particularly in the U.S. climbed to historic highs, and gas prices began to climb,deflating much of what was left of the factory muscle car craze. The car continued to be offered in the standard coupe and the sports roof or fastback configurations, with the availability of special styling and comfort packages such as the Mustang Grande package. The Mustang Grande included as standard, a vinyl roof, deluxe interior, including panel mounted clock, special wood grain appliques on the door panels, instrument cluster and other areas, a mini console. Also included were new Lambeth cloth-and-vinyl seat trim i a choice of five colors. The 1971 convertible would be the last year that Ford would produce a Mustang with a soft top for over a decade. 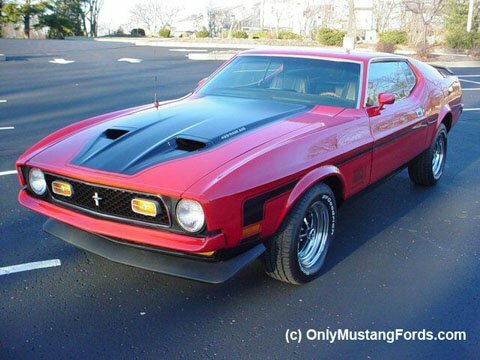 Ford's two specials, a new high performance twin hood scoop Boss 351 replacing the previous year's Boss 302 and Boss 429 and a new replacement in 1971 for the the Mach 1, adding a color keyed urethane bumper, special honeycomb grille and big graphics. Restoring a 1971 car is getting easier all the time. Many more reproduction parts have become available, even in the past 5 years. New interior kits, including carpeting, headliner, door panels and replacement seat vinyl are available from most classic Mustang parts companies. Add that to the fact that compared to earlier cars, particularly sportsroof/fastback cars, these cars are still a bargain to rebuild and restore. And if you don't have the tools or the time, you can find most of these models at reasonable prices compared to many earlier cars. and as fun as they are to restore, they're even more fun to drive!